Where did you grow up and was your family musical? I was born in Greensboro, NC. My first musical influence was my Grandmother. She could play anything she put her hands on. I was always mesmerized by that when I was a kid. Tell us about your childhood and how you came to pursue music or bass in particular. I had a very good childhood. I am blessed to have such great parents. They drove me all around the state to countless gigs, and hardly ever missed one. When I was a child I was always drawn to music. Believe it or not,I was on my way to becoming a very good drummer. It always came very natural to me. I began playing drums when I was 6,and bass when I was about 12 or 13. I was a guitar player as well. Eventually the drums, and guitar fell to the wayside, and the bass sickness took over. There is nothing like driving the low end on good song. It’s infectious. Guess that’s why we all still do it. Rhythm and pocket always grabbed me. It was never about playing a lot of notes for me. How did you become the singer you are? In no way does this question discount your incredible bass abilities but GREAT singing bass players are not a plenty and you are most certainly a GREAT one. Thanks, Dave. It means a lot for you to say that. That’s a tough one. I learned a lot listening to my Mom. She use to sing along with the radio, but it was always harmony. I always thought that was cool, and wondered how she heard those parts. Then one day it just clicked. I started hearing them. Ever since then it’s been part of my contributions to musical projects. I got up the courage to sing in front of people when I was 14 or 15. I was always kinda shy. I finally had to ask myself one day, ”how are you gonna know if you’re any good if you don’t do it in front of people?” As for getting good at it, I’m still working on it! Lol. I really started growing much stronger as a singer after I moved to Nashville. 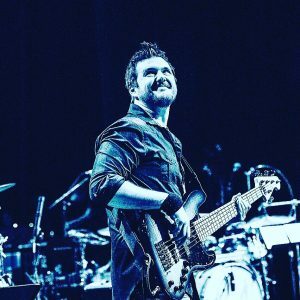 I landed a horrible paying gig, playing bass, and singing high harmonies behind a strong tenor singer, 200 plus dates, so I got a lot of practice. Thousands of cover, and some artist gigs later, here I still am. In recent years, I’ve been doing my own solo stuff. Playing in and fronting my own band in Nashville. When I’m not backing someone else up you can find me in Nashville playing acoustic, or with my band doing several gigs a week. Tell us about your career and shed some light on The Broadway scene in Nashville. What’s it like, the hours, the reality of that scene is what we are after? Like most musicians, and aspiring artists, I’ve had to pay a ton of dues. I’ve been up in the clouds, and down in the mud, but Im glad I stuck it out. I’ve been lucky enough to land some artist gigs, do some recording, travel everywhere, play some big venues, and make some people I love, proud. I have also been fortunate enough to write and record my own music. As for the Broadway scene, it can be extremely fun, and rewarding, or extremely painful, The hours are extremely long, the clientele isn’t always pleasant, and the talent level stretches from mind blowing, to ultimate mediocrity. Sometimes you don’t know who you are gigging with till you get there. I’ve never thought I was above playing Broadway. People have their opinions about it, buts it’s certainly treated me well in the past years. Even on the darkest days there, you’re still getting paid to play for a living. That can’t be all bad. I think that’s what we all of us have always been after. It doesn’t matter if you are playing Broadway, The Opry, or cutting tracks in a fancy studio, or in someone’s living room. 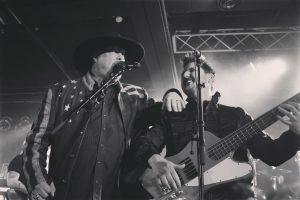 How did the Montgomery Gentry gig come about? In Nashville we always run into each other. Whether it be on Broadway, on the road, or in the studio. I had crossed paths with those guys a lot in the past years, but didn’t know them very well. I was on a gig- in Mexico at a beach resort for the the TJ Martel foundation. We were all there for a few days. I got a chance to know their band leader Eddie Kilgallon, who was himself a country music influence of mine when I was coming up. Great singer, songwriter, musician. After that we would kinda stay in touch for the next 3-4 years. We got together for a writing session a while back. I’ve been playing around town for sometime now. He texted one day and asked me where I was playing. He came out to one of my gigs, and right after asked me what I was doing after the new year. What advice would you give a young bassist moving to Nashville? Be absolutely sure that’s what you wanna do. Be ready to put in some work. Do something to separate yourself from the pack. I’ve always found that good musicians find each other. If you have something, you won’t go undiscovered long. Networking is also important. Be the best player you can ,but also be the kind of person people can stand to be around. I play predominately 5 strings these days. I’m a huge fan of Low End Basses. 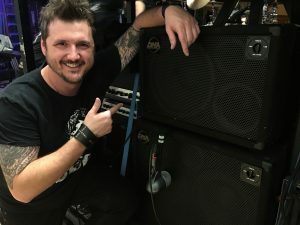 My tour and local rig is a DNA-800 amp and DNA 112 and 210 cabs. Amazing tone! Amazing company! Brian Barrett from Low End recommended DNA… and I can’t thank him enough. DNA blows me away. Quite simply the best tone I’ve ever captured. Honored to be part of the family! Who are your top 4 influences on bass? Wow! There are way too many to mention. I’ve always dug guys that really know how to drive, and build a bass track. Guys like Jamerson. My favorite Nashville guy is Kevin Swine Grantt. I was instantly drawn to his style first time I heard him. He’s definitely a big influence. Other than that, Rocco Prestia has been an all time favorite of mine. Last but not least, I would have to say Nathan East, and David Hungate. That’s 5 haha sorry! What do you draw inspiration from musically speaking? I draw my inspiration from playing with great musicians. Nothing inspires me like that. I love playing with musicians that challenge me. You always wanna reach back for that something extra when you’re on stage with serious players. In closing what’s on the Horizon for Jason Duggins? I’m hoping each and every step gets bigger. One thing about music. You can never stop growing or getting better. That’s what I’m hoping for. I’m totally happy with what I have achieved thus far, but I’m never satisfied. I’d love to achieve success in all categories. The way I look at it is, I get paid to play music for a living. Even though the business has its ups and downs, when you let that statement sink in, it’s more powerful than people realize!